JINAN -- Yan Fang is busy wrapping up a seal engraved with the name "Matthew," headed to the buyer from the other side of the Pacific Ocean after China's Singles' Day. She works in a seal workshop in the city of Qufu, the birthplace of Confucius in East China's Shandong province. "This is one of the 6,000 packages that are to be delivered on a normal day," said Yan. Yan and her colleagues are busy packing up more than 100,000 packages for this year's Singles' Day (China's online shopping spree which falls on Nov 11 each year). "We received about 30,000 orders for this year's Singles' Day, three times that of last year," said Zhang Kai, 31, manager of the seal workshop Kongfu Yinge (Kong Family Mansion Seal Workshop) Co, Ltd.
"Online promotions help the business grow faster, but I'd rather stay true to my aspiration of sharing and protecting seal culture than seek economic benefits," he said. In Zhang's workshop, seals engraved with English names such as Matthew are not as rare as they were ten years ago. For thousands of years, seals have been used as a symbol of imperial power and certifying one's good faith. Over the ages, seal cutting has evolved into a unique form of Chinese art, closely related to Chinese calligraphy. The logo of the Beijing 2008 Olympic Games was a manifestation of seal culture. In Zhang's seal workshop, after designing a font and tracing a mirror image of the script, Kong Lingjia, a 34-year-old master seal engraver, carefully cuts the inscription on a small pebble. "The process of seal engraving is a unique and miraculous way to express one's sentiment for traditional culture," said Kong. Zhang's workshop, situated close to the UNESCO World Heritage Site Cemetery of Confucius, now has over 700 staffs. However, about ten years ago, most of them ran private stores engraving and selling seals on streets around the heritage site. Zhang's father, a local renowned seal engraver, was one of them. Zhang said those seal stores used to viciously compete with each other, which was bad for the traditional seal culture. To better protect seal culture and share it with more people, Zhang opened an online store in 2007 and helped his father build a seal workshop, welcoming local seal engravers to join them. In recent years, his store has become one of the largest online seal stores with an average yearly income of about 20 million yuan ($2.89 million). Zhang is not alone. His community, Linqian Community, was recently listed as a "Taobao Village" by Alibaba and the Bureau of Commerce of the Qufu city government to honor its contribution to the local cultural and economic development and the online retail website. Most of the stores in Linqian Community sell cultural and creative products such as Hanfu (the traditional, historical dress of the Han people, the largest ethnic group in China), carved wood sculptures, and Chinese paintings and calligraphy. Due to its proximity to the Temple and Cemetery of Confucius and the Kong Family Mansion, Linqian has always been abundant in cultural resources. These online stores help the community share the seal culture with people from home and abroad, according to Kong Xianglong, party chief of the community committee. Linqian Community is the first "Taobao Village" in county-level Qufu city. With more and more Confucius themed creative products sold worldwide from his birthplace, it is considered as a new way to communicate with the world. Unlike people from his father's generation, Zhang not only focuses on the carving techniques but also the designing of the seal and the development and acceptability of the ancient seal culture in modern society. These days, Zhang usually works until early in the morning to analyze the data collected during the daytime to optimize the next day's management and selling strategy. "Online shopping and big data enable us to understand customers' preferences so we can provide customized products." Zhang presented a seal painted with a Beijing Opera figure and a Monkey-King-shaped seal and said they are newly designed decorations based on the analysis of the recent market demand. According to the Bureau of Commerce of the Qufu city government, there are over 500 Taobao online stores in the community, and the total transaction amount from 2017 stood at 150 million yuan. The raw materials of the workshop come from all over the world including Russia, India, and Afghanistan. 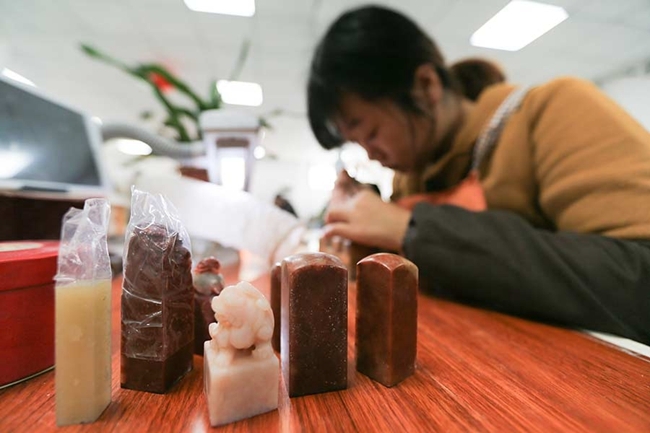 These little pebbles are processed into creative stamps and then sold across the world along with traditional Chinese culture, according to Zhang Kai. "Seals have been playing an active role in personal cultivation and global cultural exchange," Kong Lingjia said, adding that a careful engraving work can add a touch of civilization to a piece of naturally beautiful stone thus bestowing it with high artistic quality. "I want to share my affection for traditional seal culture to the world through the Internet," Zhang said.